I was going for a spun sugar cupcake look but ran out of patience and decided to use a dotting tool to draw on the strands of icing. I also used the dotting tool to create random patterns on my index and middle fingers. I finished off each nail by sprinkling some microbeads on top of them and patting them in. Be sure to click on the above image in order to view it in all its glorious detail! I did these at night and by the time I woke up, all the colour had rubbed off the microbeads leaving them silver. That was quite disappointing but the beads did stay on quite well. I love how these nails turned out and they definitely remind me of cupcakes and icing. I also loved how 3D they were. They’d fit in well with the Candy Wonderland depicted in Katy Perry’s “California Gurls” music video. 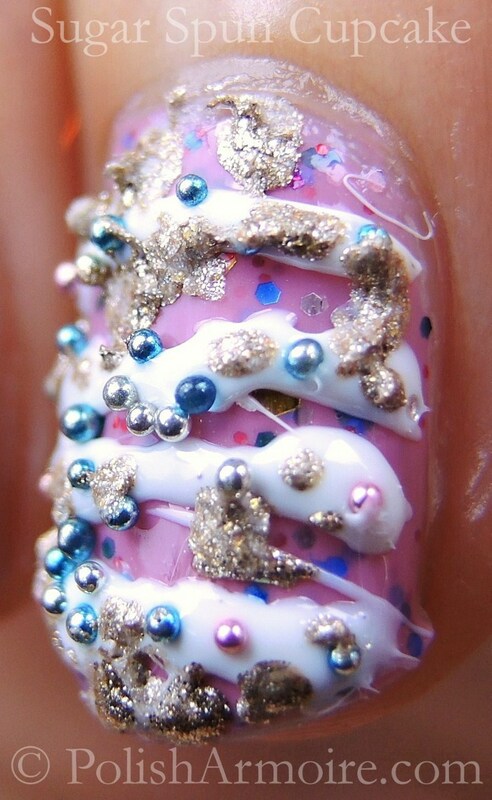 Tags: 3D Nail Art, Cupcakes, Microbeads, Spun Sugar Manin. Bookmark the permalink. Thank you! I definitely loved the accent nail =) All the components stayed on quite nicely too, a shame that the colour on the microbeads rubbed off after one night of sleep.